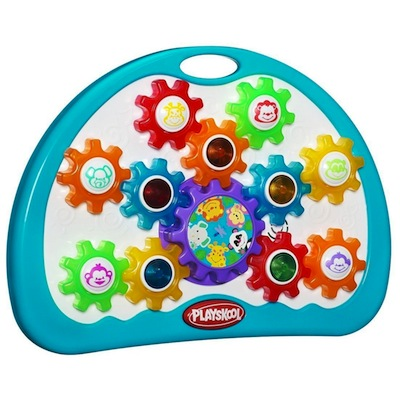 Put your little one "in a spin" with this captivating set of colorful gears! Press the button to make these bright gears turn and, as they, do watch your child giggle with glee as fun music plays and little lights twinkle. Once baby gets a little older, these interchangeable gears can be removed from the gear center for stacking and sorting hands-on play. This set "turns" discovering colors, counting and sorting into tons of fun! Set includes gear center, 11 gears and instructions. Includes 3 "AA" batteries. Ages 12 months and up.